I enjoy the occasional gourmet coffee and will try any new place if I see one. There is a Blue Bottle coffee a couple blocks away and I’ve begun treating myself once a week. What is interesting is that the shop itself is kind of an escape from the city. It’s small and quaint with hipsters hand making each beverage. They have gourmet snacks and brown kraft paper wrapped bags of coffee, but what strikes me is that everyone seems to feed on the nice atmosphere. We’re all paying a bit more for something that you can get on every street corner, but tastes like the care taken to make each one. I like the idea that getting a cup of coffee like this makes me stop and enjoy it. They took care to make it, I’ll take care to enjoy it. We all run around worrying about the past or the future… stop and smell the coffee. 😉 Live in the moment and enjoy the taste. What’s a good coffee to try if one does not like the taste of coffee? Hmm… that’s a tough one. Coffee is bitter by nature. I remember when I started drinking coffee I added a lot of milk and sugar… “light & sweet”. Over time I cut back the milk & sugar and now I will drink it black. I DO believe it is something that you acquire a taste for… like certain beers or wines. 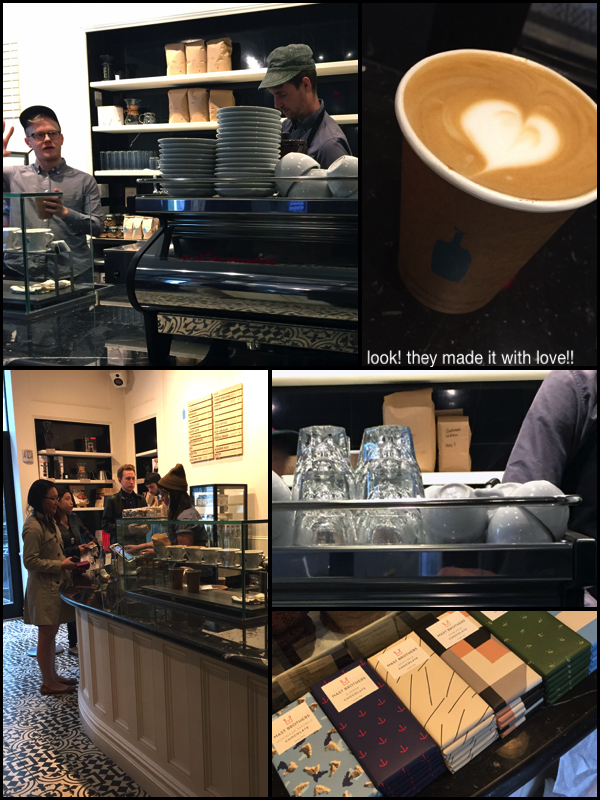 I like the latte from Blue Bottle as the milk smooths it out and the bitterness is reduced. There ARE lighter roasts that aren’t super strong… just like light beers.